At 3,824,642, New York State has the 2nd largest Black population of any state in the nation. The vast majority of African Americans in the state live in New York City and its surrounding counties. In the rest of the state commonly referred to as Upstate New York, African Americans live almost entirely in urban areas and mostly within city limits. These areas are mid-sized mostly manufacturing based cities such as Buffalo, Syracuse, and Rochester. 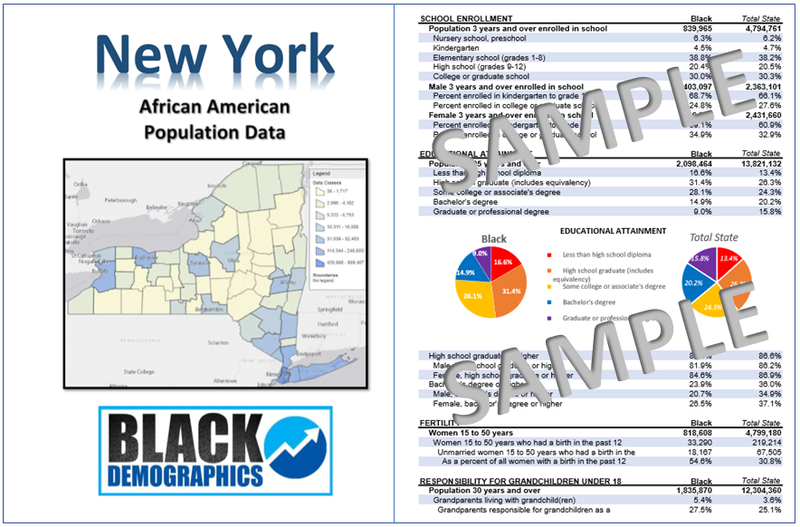 African American concentrations can also be found in smaller cities and towns in or near the Hudson Valley between New York City and Albany such as Poughkeepsie, Newburgh, and Monticello. During the last few decades Black Americans began experiencing a decline in the quality of living and thousands have opted to move to other parts of the country in search of better opportunities. Although African Americans have been leaving the State in large numbers their population has been replaced by Black immigration from Africa and the Caribbean. Those of direct Sub Saharan African descent total 255,118. Blacks of Caribbean descent number even higher at 809,022. After the Civil war there were groups of Black migrant farmers who went to work the farms in rural upstate New York. Some stayed and their descendants can be found today in small cities such as Geneva and Newark, NY. But it was during the Great Migrations north that increased New York’s Black population aggressively. African Americans took the trains north from Virginia, Georgia, Florida, and the Carolinas and settling in Black sections of Harlem, Brooklyn, Bronx, Buffalo, and Rochester in search of better opportunities. New York City now has the largest Black population of any city in the United States with 3.4 Million African Americans living in its city limits.